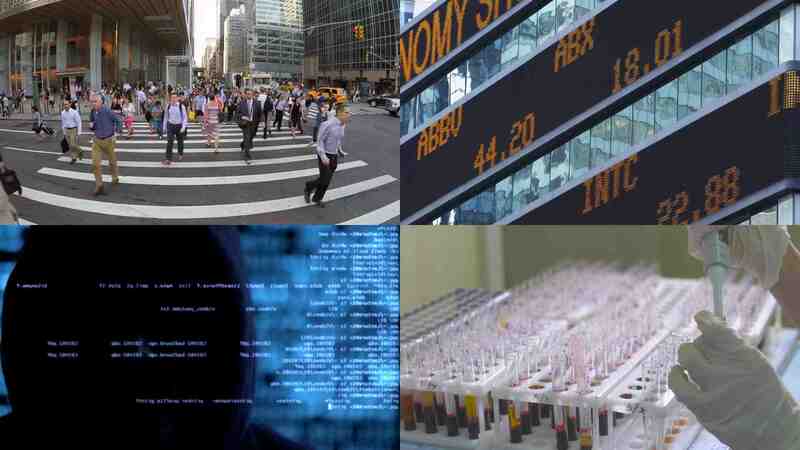 Build solutions for financial crime, law enforcement, intelligence, cybersecurity and more. 10x to 50x faster than using open-source alone. Quickly find answers and free analysts from costly rigid data models. Siren is the alternative. While mainstream investigative solutions restrain analysts from turning raw data into investigative intelligence, building your capabilities on top of open-source can look tempting at first, but investigators require advanced design and features which are very complex to develop and maintain. The Siren Platform™ addresses these issues by leveraging well-known big data open-source Elasticsearch platform as well as extending its capabilities by operating on “data where it is” be it on Hadoop or relational databases. You will deliver 10x to 50x faster then developing from Open Source alone. Your users will get beyond state of the art capabilities where Elasticsearch scale dashboards, relational data workflows, link analysis and “data where it is” come together, coherently. Differentiating features for Investigative solutions. Interactive dashboards: Entity centric, 360 degree view dashboards. 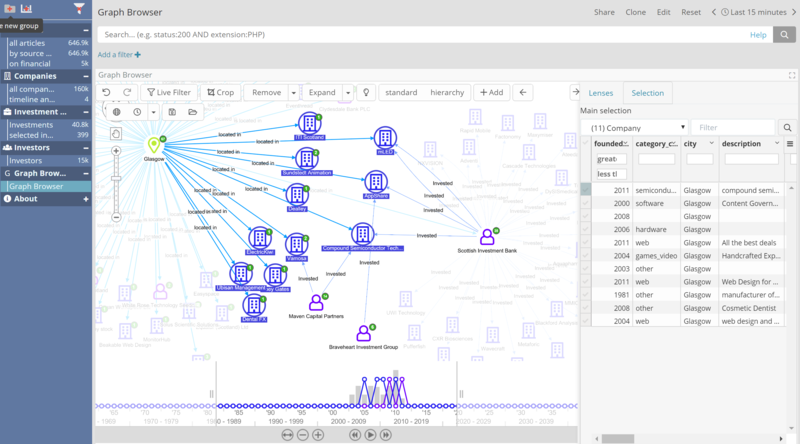 Data relationships underpin Siren’s user experience enabling users to instinctively navigate from a “set of entities” to a “set of connected entities”. Dynamic, UI edited, relational data model: Creates a knowledge graph leveraging existing data sources and infrastructure. Link analysis: with spatial (relations on map) and temporal (over time network evolution) support. Leverage and explore data in its native environment: Supercharge Elasticsearch and graph pattern queries leveraging graph DBs. Large scale UI driven data imports/exports: PDF/PNG reporting on-demand or driven by data conditionally aware alerts or user set schedules. Comprehensive search engine “across all entities”: On the fly entity clustering, extraction of significant terms, similarity search, Natural Language Processing (including multilingual support and relationship extraction). AI driven Entity Resolution: Non-monotonic reasoning over incomplete and partially similar entities. On the fly REST service lookups: Enhancing and expanding visual link analysis results and dashboards. Scalable and nimble platform: Extensible, source code available and API driven. Anti-money laundering, fraud and authentication management, financial markets compliance and market surveillance. 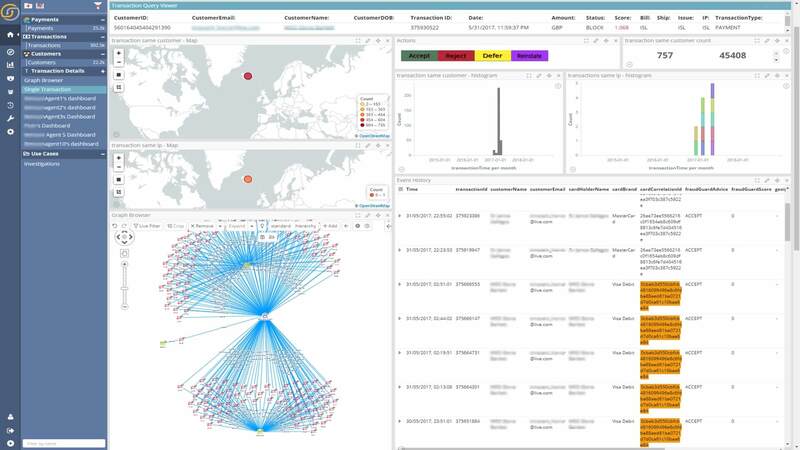 Rapidly move from investigative insights to actionable intelligence. L2/L3 SOC analysis, threat hunting, enterprise security management. A complete, nible and intuitive data intelligence platform to derive insights from your data today!